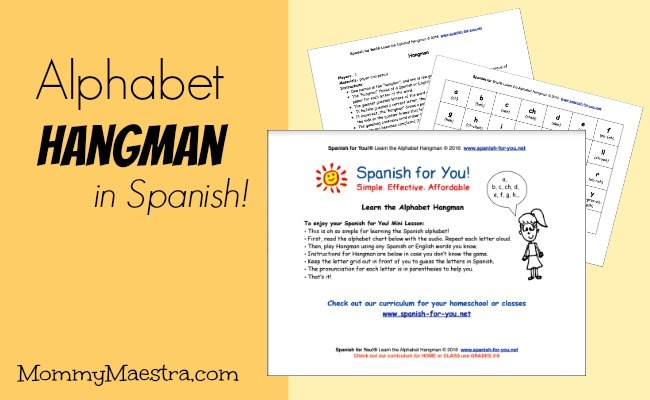 As promised, I'm delighted to share a second freebie this month from our sponsor, Spanish for You! We are so grateful to them for the excellent downloads that they offer MommyMaestra readers every month. I really hope that if you have a middle schooler who is learning Spanish, that you consider purchasing some of their excellent materials, most of which are available for immediate download from their website. Today's download is a 3-page activity to help your child/student learn the Spanish alphabet. Help them learn not only how to pronounce letters in Spanish, but how to spell Spanish words! It includes a pronunciation guide of the alphabet, directions for playing Hangman in Spanish, and an audio file. I love that you can use this game over and over as your child's vocabulary grows. Please! Stop teaching the letters Ch, Ll. They were removed from the Spanish alphabet many years ago.